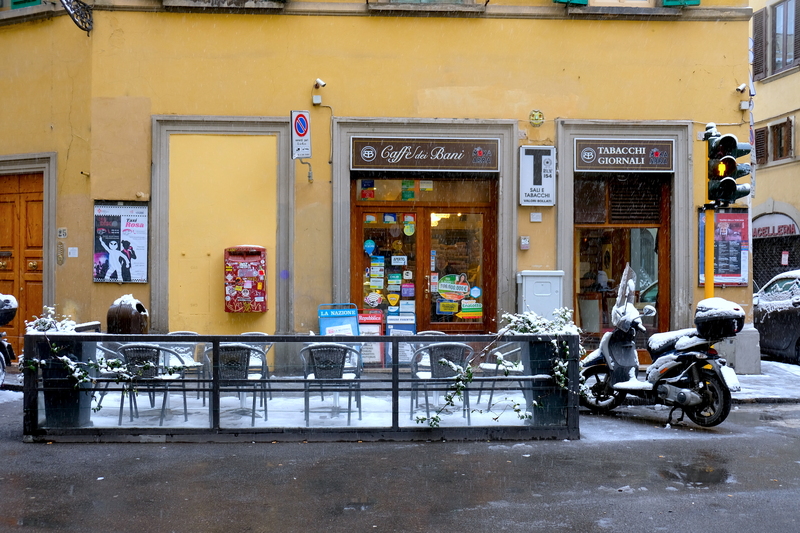 I’ve been here for 11 years and I’ve never really seen it snow in Florence. However this morning (March 1st by the way) everything changed with one light, beautiful snowfall and I couldn’t help rushing to write this post to share this rare treat with you guys. Naturally by the time you read this, the snow will have turned into rain and the city will be one slushy, slippery hot mess. Be careful with your shoe choices guys..
As soon as I saw the rooftops outside our home, I rushed to get dressed to go outside and have my childish dream come true, but first I needed a coffee. Apparently, I wasn’t alone. Plenty of people were outside with their large coats and huge scarfs making snowmen and photographing a very different scene to that of which normally is the first day of March. 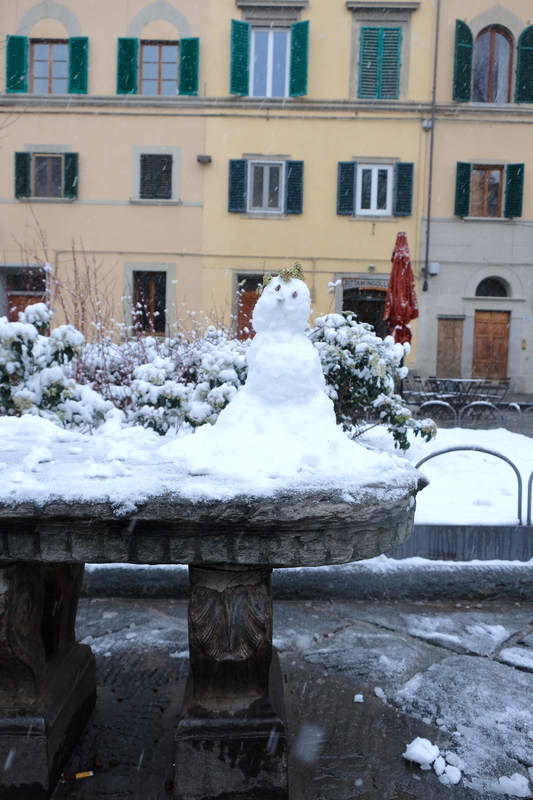 Snow clung on tree branches, piled on ancient stone fountains and made every bench a scene out of a movie, albeit a very cold one. 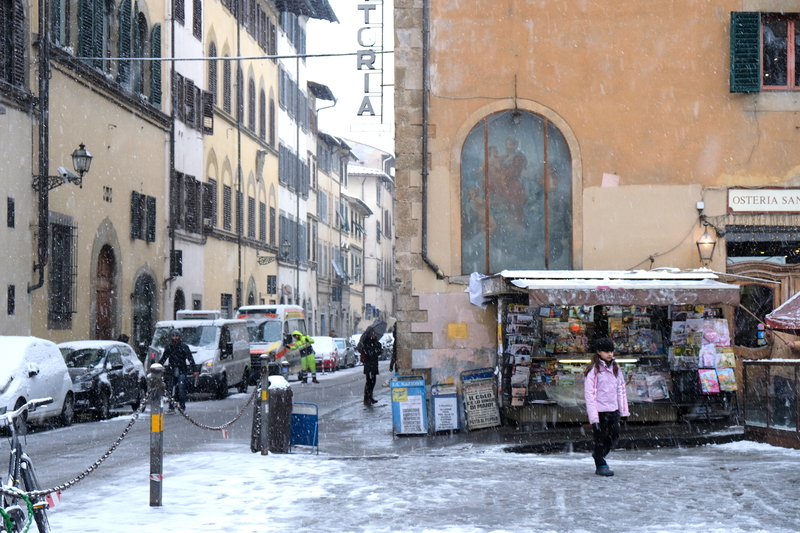 I walked to Piazza Santo Spirito and I wasn’t at all disappointed, in fact here’s a short video from this morning’s adventures. One memory of a snowfall I missed dates back to 2010 (snowed enough to stick on the ground) when Europe was again under a cold spell. In that year alone the city got more than 28 centimeters leading people to abandon their cars along highways and buses to stop in the middle of the street. The city wasn’t properly prepared which is why now they take any semblance of snow super seriously, cancelling schools and bringing out the snow truck and salt. 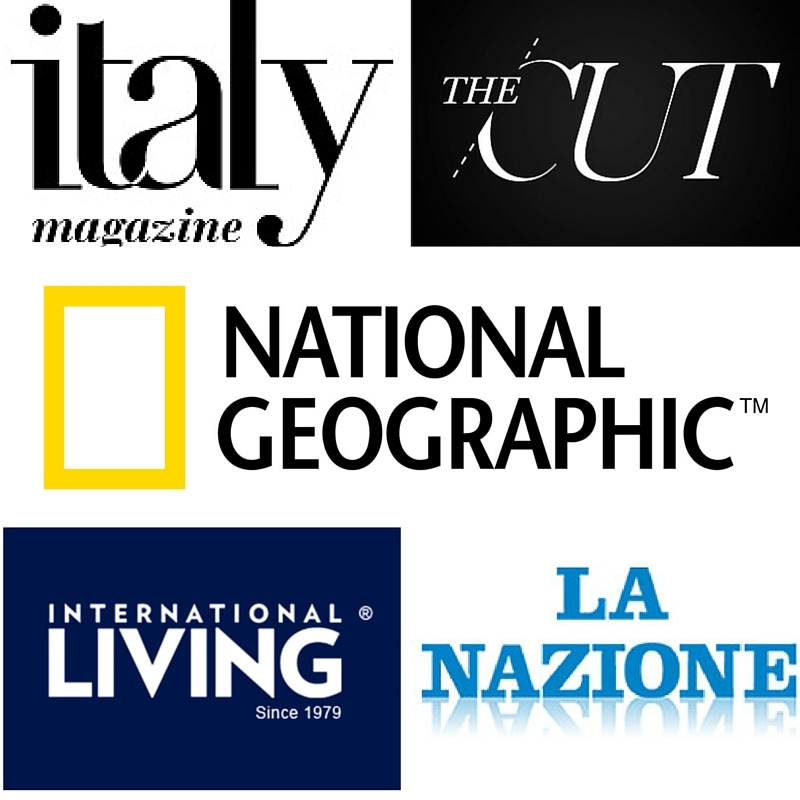 So we’ve been watching the news reports of Venice, Rome, and myriad of other cities blanketed in a sea of white but since it rarely touches this Renaissance city due to its unique topography, I had completely given up hope. That’s of course normally when something actually happens. 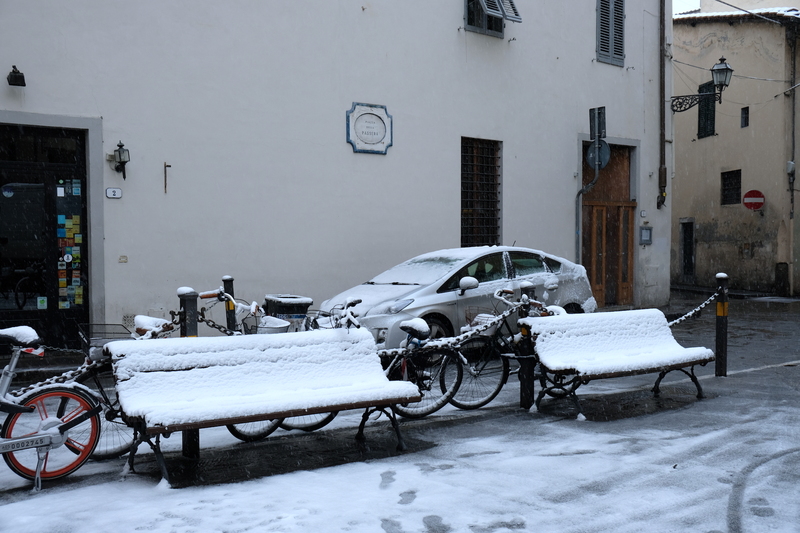 This freezing Burian wind from East Asia is too powerful a force to leave Florence completely untouched and honestly, I am not complaining. This winter has been a bit of brutal one and when I start to complain it’s always important to remember about how lucky we are that we have a roof over our head and can afford to pay our heating bills. Luckily there are organizations in Florence that help those who are the most in need. 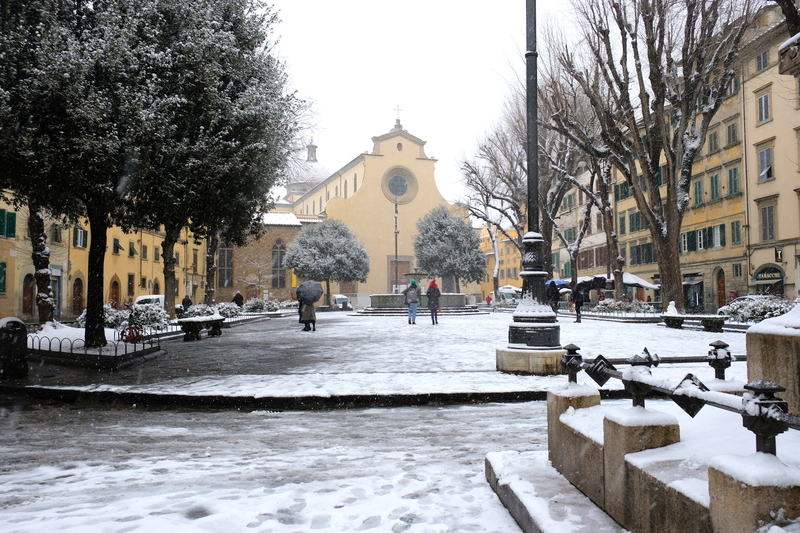 If you see someone sleeping on the street in this freezing weather you can send an email to assessore.funaro@comune.it or call from Monday to Friday until 6 pm: +39 055 2769141. 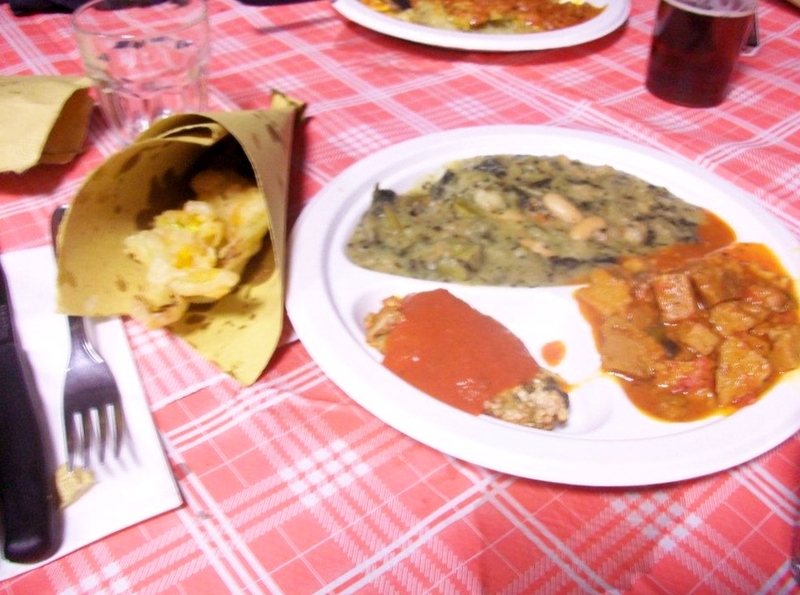 From 6pm onwards, and on the weekend you need to call instead Pertini Forester +39 055-6533117. 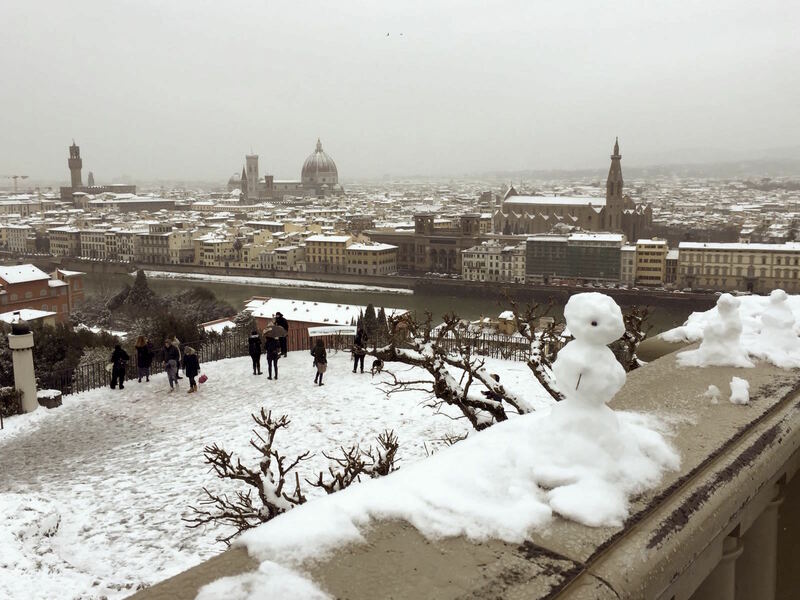 I am going to keep this post short and sweet because I am working on a fantastic list of personal suggestions on what to do around Florence for this month so enjoy these photos from around Florence, I also included a few favorite instagram shares from places about “snow day Florence 2018.” Stay warm folks! Very nice. Thanks for sharing your snow photos. 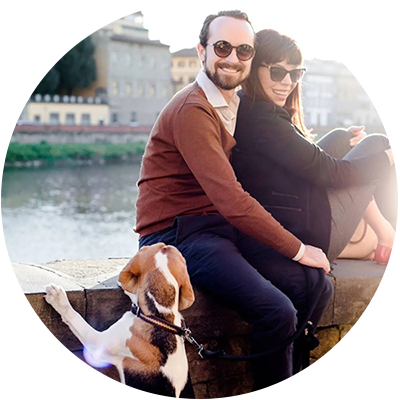 We were in Florence 4 months ago and loved it. I remember that snowfall mostly because I wasn’t here to enjoy it, I was visiting family in the States. That’s too bad you were so delayed but luckily you made it work. Love, love, love this! Wish I was there to experience and see it first hand! It doesn’t happen very often and it’s probably a bit concerning that it did occur on the first of March and not January, however it was absolutely beautiful. I just wish it could have lasted a little longer. I’d love to see the UK in the snow too! Wonderful post, thank you! 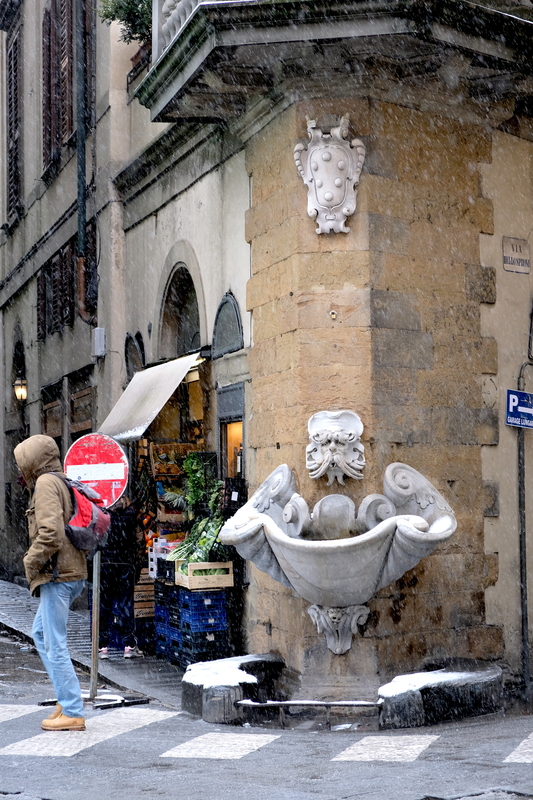 I happened to be living in Florence during 2010’s first snowfall and it was a fantastic, surreal experience to walk thru the city as the flakes settled on the beautiful face of your city. BTW: Your photo is gorgeous, you look grand! Thank you Ina! It’s a short and sweet one this time but I found this rare snowfall a worth time to whip up a photo post. Thank you for your kind word, it was VERY early when I made my way around the city. Wow! Florence in white is such a rare sight! I’ve only been to the beautiful city you call home during autumn and I enjoyed warm and sweet-scented evenings. 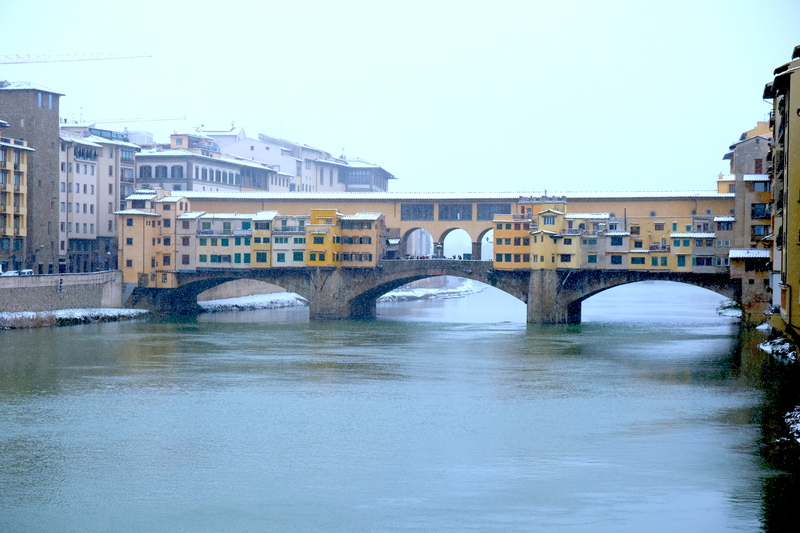 However, as all things Italian, Florence is wonderful no matter the weather. 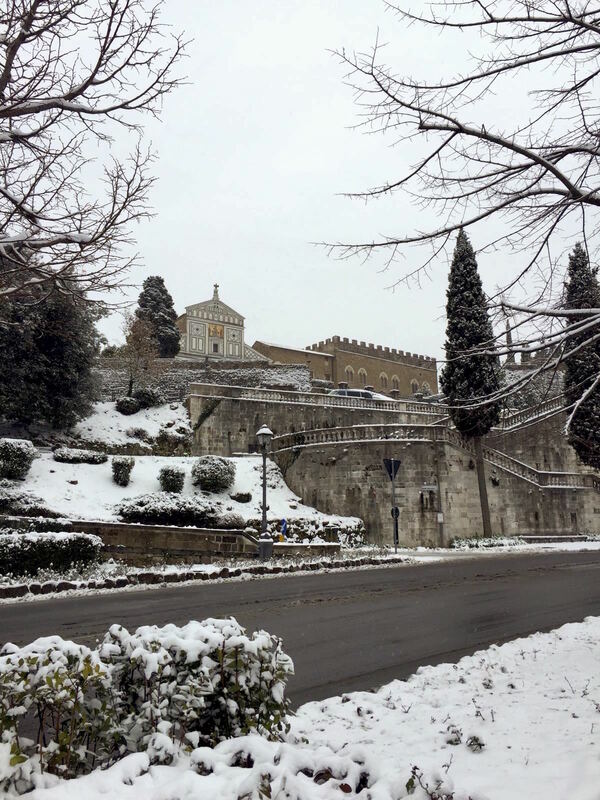 I loved your photo story because I rarely see snow too as I live in Athens, Greece; just so you know, today our temperature was as low as 11C LOL! However, no matter how much I enjoy playing with the snow I can’t help but think of the people who suffer from the cold and I love you so much for mentioning them and for including those helplines in your post! Thank you Maria! My friend Coral and I were talking about this topic recently (of those without homes or heating) and while it’s easy for us to complain about it, for some it is truly a desperate situation. I just want people to know that if they see something, they CAN take action. Did Greece see any snow as well this year? No, no snow for us yet. 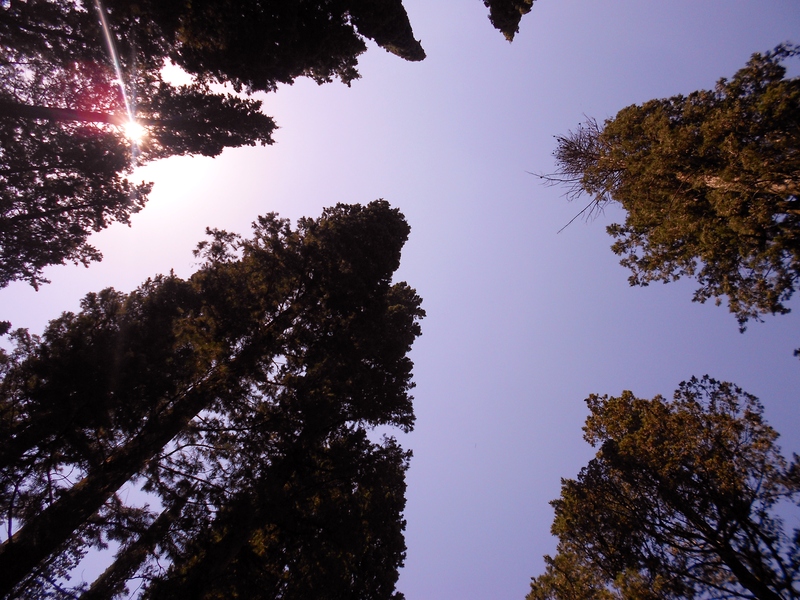 And it seems that spring is here to stay. However, you never know; we’ve seen snow in March before! Darling! love the selfie (snow looks good on you! 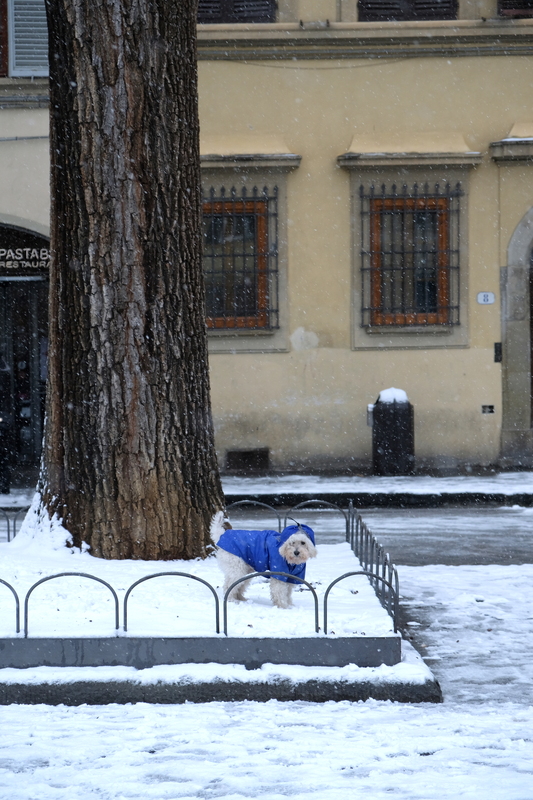 )- and thanks for compiling 50 shades of snow in Florence- baci! The same happened in Madrid in early February. 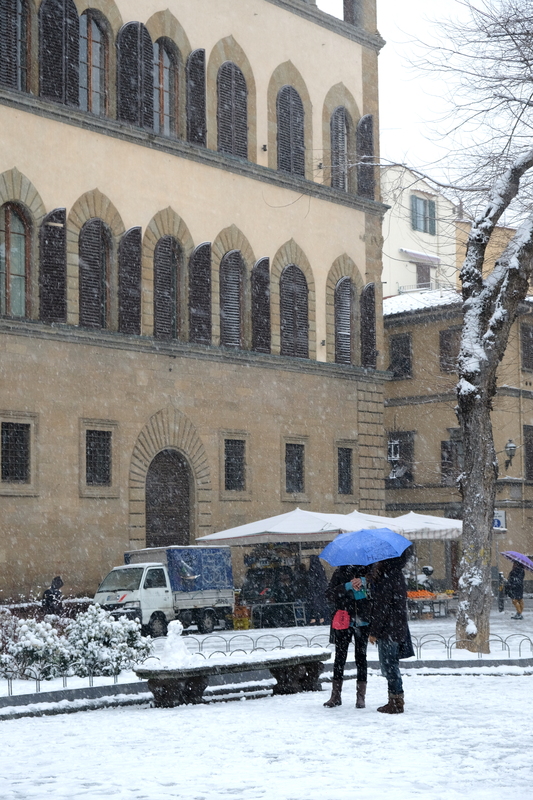 It hadn’t stuck in eight years and – while I admittedly moved to Spain to NOT see snow – was a lovely site! It seems that Europe as a whole is undergoing quite the cold spell. Madrid must have been majestic in the snow! Gorgeous photos! 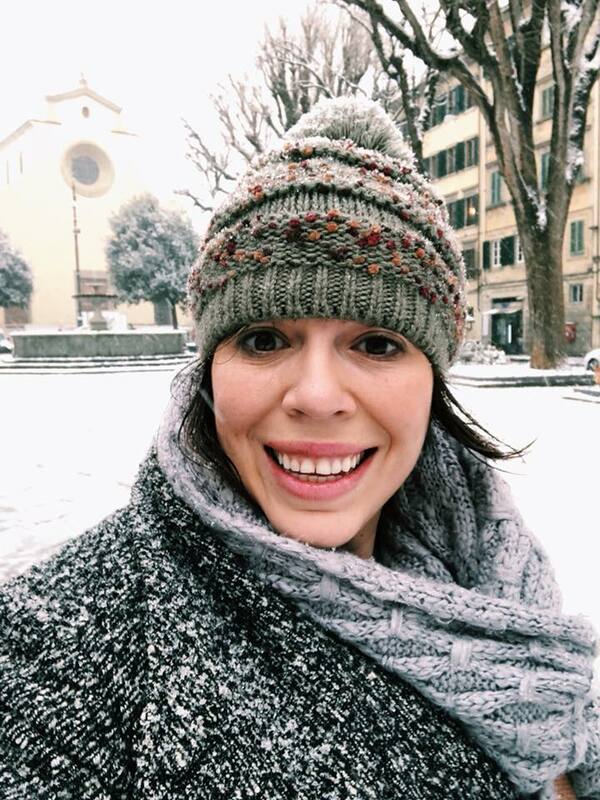 I was due to fly home from a semester in Florence the morning after that 2010 snow storm and almost missed Christmas because of the flight delays… BUT my favorite moment was walking back to our apt after our final dinner, only to end up in a snowball fight with some Italians! 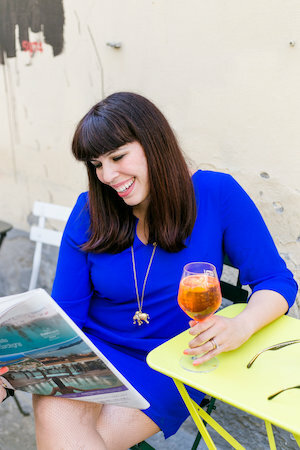 Love your site and your post made me smile and long to get out of sunny California. 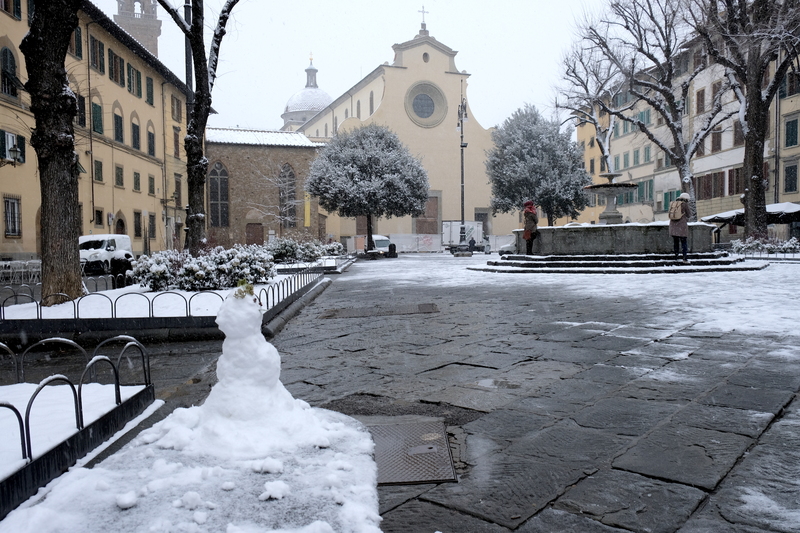 My husband, daughter, and I were in Florence at Christmas time 2005 when it snowed a few days after. Hadn’t snowed in over 20 years. 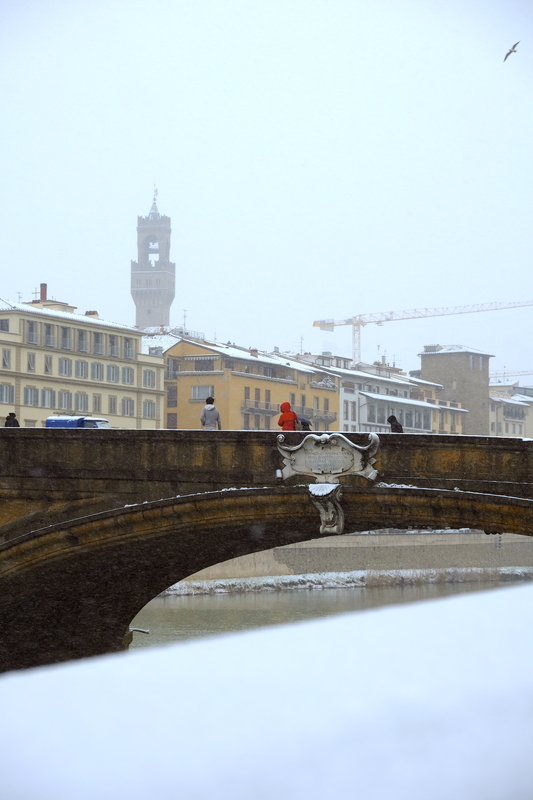 Made this magical city all the more and we have beautiful photos of fat flakes drifting down at night over the Ponte Vecchio. We traveled to Sienna the next day and had a ball watching kids using anything slippery they could find to slide down the gentle slope of the Piazza del Campo.